Building owners are struggling to find tenants in Business Bay, the vast project envisioned as Dubai’s new central commercial district. About 80 per cent of the completed office space in the project is empty, property agents say. And offices are renting for as much as 50 per cent less than space in nearby Downtown Dubai, where the Burj Khalifa, the world’s tallest building, is located. 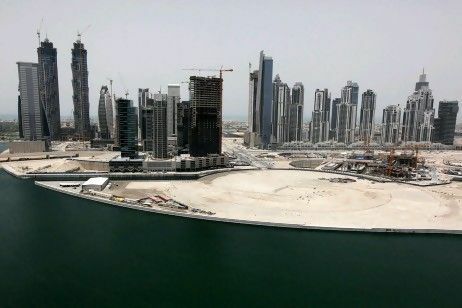 “The problem is there are very few deals being done, so it’s hard to say how much rents are falling,” said Craig Plumb, the head of research for Jones Lang LaSalle in Dubai. Business Bay was designed to create a business and residential district on “the scale of Manhattan”, with a price tag of US$30 billion (Dh110.18bn), according to promotional materials. Plans called for more than 200 towers covering more than 7 million square metres around the man-made Dubai Creek. But today most of the project is still a construction site. Many plots are nothing more than dirt and several half-built projects have stalled. Residential buildings in the development are faring little better than office space. The average lease for a one-bedroom apartment in Business Bay is Dh55,000 a year, compared with Dh75,000 in Downtown Dubai, according to CB Richard Ellis (CBRE) data. Work has progressed slowly on the infrastructure for the development, including roads, power and landscaping, according to informed sources. The master developer is Dubai Properties Group, a subsidiary of Dubai Holding, which has struggled with debt after the property market downturn. Construction was completed a year ago on 0-14, the office tower known as the Swiss Cheese building for its perforated white concrete skin, but electricity was not hooked up until this spring, said Shahab Lutfi, the chief executive of HH Investment & Development, which built the tower. The 22-storey building still lacks permanent sewerage and water connections, Mr Lutfi said, adding about a quarter of 0-14 is occupied. A spokesman for Dubai Properties said infrastructure for the first phase of Business Bay near Sheikh Zayed Road is already in place and by the end of this year “all the extra enhancements in relation to roads and landscaping will be complete” in the phase. This year Bay Avenue, a 16,250 sq metre retail complex, is set to open and the infrastructure in phase two will be “further developed over the course of the next 12 months”, the spokesman said. Business Bay is a tough sell while it is still a construction site, agents say, particularly as companies have an array of choices in Dubai. Nearly half of Dubai office space lies empty, they say. “I think there is a lot of reluctance from occupiers to move in unless everything is properly completed,” said Matthew Green, the head of research and consultancy for CBRE in the Middle East. More than 202,000 sq metres of office space has already been built in Business Bay – about the same as the total space available in Abu Dhabi – as well as 2,300 residential units, CBRE said. An additional 279,000 sq metres of office space and 1,900 residential units are scheduled for completion this year, CBRE said. Most of the office buildings in Business Bay are strata buildings with more than one owner. The strata issue makes recruiting tenants more difficult than it is with single-owner buildings, agents say. Burj Khalifa (Dubai)Flat For Shilpa From Kundra On First Wedding Anniversery!